Ever since the music video for Drake's "Hotline Bling" dropped last month, fans have been blessed with the never-ending meme of the star's dorky, but now iconic, dance moves. And why should it end? The rapper should feel free to break 'em out whenever and however he wants. And it looks like Drizzy is doing just that — Drake danced to "Hotline Bling" at a Los Angeles Clippers game over the weekend, and it was glorious. An on-looker tweeted a video of Drake sitting courtside at the Staples Center and doing the hand-phone move as "Hotline Bling" blasted on the speakers. Sure, it only lasted for a few seconds, but it was just enough to make me love Drake even more than I already did. It showed that he's not embarrassed about all the fuss his dancing has created — instead, he's totally embracing it. 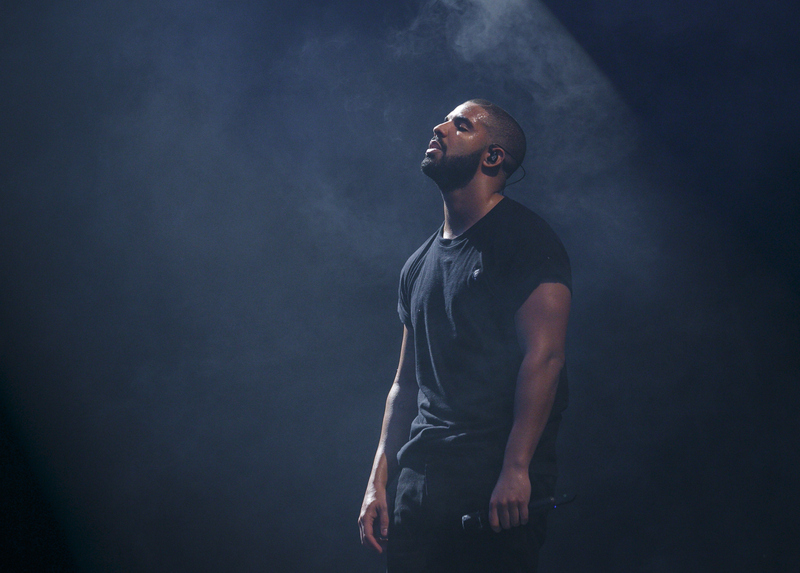 "Hotline Bling" may have fallen short of taking the No. 1 spot on the Billboard charts, but that doesn't mean the song is any less of a sensation this fall. The catchy-as-hell tune has spawned numerous covers — notably by Sam Smith, Sufjan Stevens, and Erykah Badu — and was even featured on Saturday Night Live this weekend with GOP presidential candidate Donald Trump dancing to a parody of the song. And I dare you not to sing along when "Hotline Bling" comes on wherever you happen to be. As for Drake, he can't seem to help but dance a little when his new signature song plays, even at an NBA game. This can only mean one thing: Drake's gotta break out these moves in other random places. I've got some ideas. Drake has already strutted in a drug store for the "Started From The Bottom" video, but what if he took his slick dancing to Trader Joe's, the best of the best in supermarkets? He'll probably give you exactly what you ask for — free samples, Hawaiian shirts, and chia seeds. Drizzy's dancing could become the new "wax on, wax off" of the car washing world. The other big hit of the fall is also making some waves with memes, especially with the video combining Adele's "Hello" with Lionel Richie's "Hello." Such perfection. With that said, let's get Drake over to this Montreal house and have him to do "Hotline Bling" dancing — and he could say Adele used to call him on his flip phone. Whoever made this GIF knows how to make dreams come true. Now, let's make it really happen with Drake dancing among the Skee-ball, whack-a-mole, and pizza. I mean, duh. As a long-time fan of Degrassi, I know that Drake bestowed his awesome dance moves on the Canadian teen soap for years, but you know would be even better? If he brought "Hotline Bling" to the halls of Degrassi: The New Class when it debuts on Netflix. Drake's always boasting how much money he has, so why doesn't he take that to the bank — literally? Dance with your money like no one's watching, like Scrooge McDuck. No matter where Drake dances, it's clear — we need more of his dancing in our lives. Make it so, Drizzy.